When you need a high-quality image, it’s hard to beat the resolution and lens options of a DSLR. But what if you want to take a photo over and over at set intervals to produce a time-lapse sequence? You could purchase an intervalometer, or make one using an Arduino Nano. 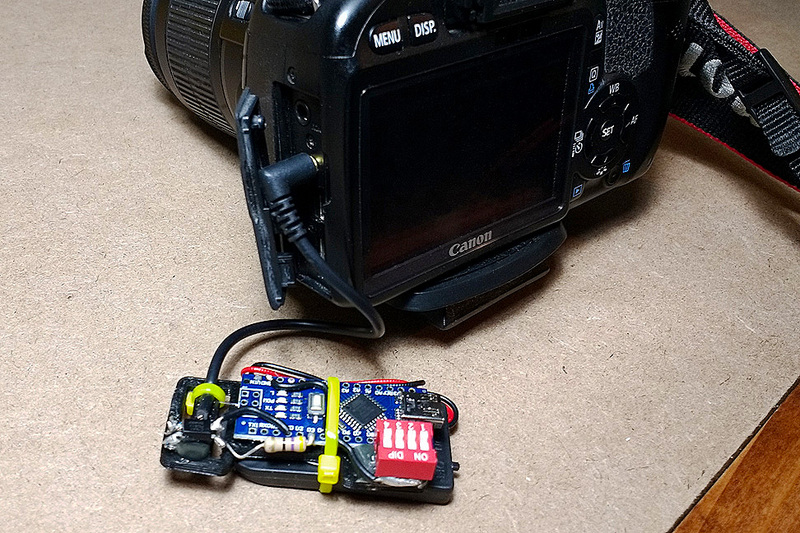 The device shown in the video below uses a 2.5mm audio plug for the input to a Canon T2i camera. An opto-isolator is activated by the Nano, connecting the ground (base) and tip (shutter) pins. Intervals are set via a 4-position DIP switch, allowing photo intervals of 5, 10, 30, and 60 seconds—or any combination thereof. While the functionality shown is quite basic, the setup could be adapted for other timing patterns, or even for use with a sensor. Build instructions are available here, and you can find code and the 3D-printed base on GitHub.